What would be a better way to extend our data driven service portfolio than to offer advanced marketing analytics services? And to do this with world-class technology and providing clients with actual service, not technology to be handled alone. Nothing, I would say! 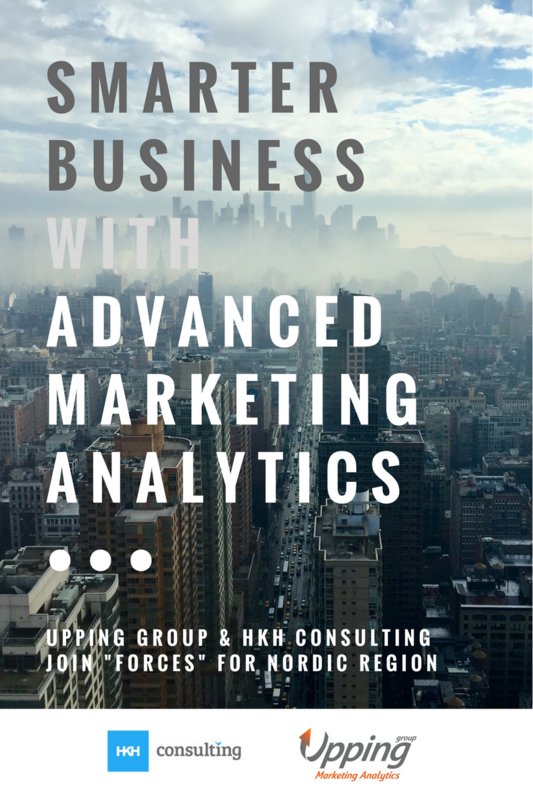 Extending our services into advanced marketing analytics was made possible by partnering up with the best in class service provider, Upping Group. Thanks Luis, Margarida and Sofia for this great opportunity! I am personally certainly excited about this new cooperation that I had the luxury engage into and if you are a decision maker for a business in the Nordic Region (regardless if your business is BtoB or BtoC) you should be excited too! Through our cooperation we are able to deliver various Advanced Marketing Analytics techniques for our clients use through 60+ years of combined knowledge from marketing analytics. All this for you to make your marketing spend more profitable! We don’t aim to sell you technology or software that you need to manage yourself. As a 110% service provider we act as your advanced marketing analytics partner basing our analysis, recommendations and actions using techniques such as; cluster analysis, basket analysis, predictive modeling and customer centric analysis. Our solutions provide added value regardless of the industry you operate in. Whether you have BtoB or BtoC business in e.g., automative industry, finance, sports, ICT, or FMCG our Advanced Marketing Analytics service is capable of transforming ”hidden information” into a valuable asset for your company! Start unlocking the value of your data! So, why not start unlocking the value of your data by getting in contact about free Proof of Concept already today! Read more about the expansion of Upping from the company issued press release below. Italy and the Nordic countries are the first bets for the international expansion of Upping, a Portuguese marketing analytics consultancy founded a year ago. ”Internationalization will allow us to put the experience of decades to the service of companies in the global market. These are markets with high analytical maturity, for which we have a local representation that brings local experience and knowledge, ”explains Sofia Seno, one of the three partners of the consultancy along with Luís Rebelo and Margarida Osório. Valerio Barbesino will be responsible for operations in Italy, while the Nordic countries will be lead by HKH Management Consulting and Jari Helenius, based in Helsinki, Finland. The company uses analytical technologies to help customers ”develop customized offerings by customer segment, identify new revenue streams, anticipate future behavior or optimize management on social networks and customer service , Among others ”. Among Upping’s clients are brands such as Benfica, Unitel t+, Bluebird. The copy in the press release is a free translation from the original Portuguese press release by Pedro Durães for Meios & Publicidade online edition, January 30th 2017. Translation is approved by Upping Group.